4 YEARS ago I had kidney cancer. I cured it in 6 weeks. The problem that lingered was a kidney infection. Try as I may I just could not get rid of it. In fear that the cancer would return and Ramadan was fast approaching and I so wanted to fast and so I did a bad thing. I called my friend Dr. Munif and asked for an antibiotic as this infection was a problem. He told me what to buy and they did not have the anti-biotic but had one similar. So I went home and took 1 pill and had a stroke in my sleep. I did not realize I had a stroke as the symptoms were vague when I woke up. I just could not see. I tried to focus on the computer and it was so blurry. My eyes were gone for around 2 hours and then returned. But each day they went out again. I called Dr. Munif and he referred me to an eye doctor who told me I needed some kind of procedure in Amman to shoot dye into the veins near my eye or to go to a stroke doctor. Well I knew I did not have a stroke. mean I may have had a stroke and he said, NO. You already had one. While I am vastly against MRI's he convinced me it was a must. So I went and guess what he was right. I had a stroke and 2 prior ones too. I just cried. I went to the taxi and just cried. After the stroke caused by the medicine (CIPRO) I continued to have electric shocks, deep tendon pain and numbness. He gave me some meds to take, but I did not want to take any more meds. 3 months later I would have a major break in the cartilage in my knee. I did not have any insurance and could not afford a special doctor and so for 1 year I suffered horribly in pain. I cold not walk. I had to have a special walker made and I used a cane. I could not leave my home as the stairs were too much for me to climb. For 1 year I lived alone. OH how the people laughed and judged me. Oh how they enjoyed how the richest woman on the block was now nothing. I would cry at night from the humiliation. I started ordering herbs from the US and supplements. I would read on what would cure this and tried everything. I ordered so many things, the government became suspicious of me. Eventually met a man with a bus and he could make a step ladder for me to climb into his van and so I could get to town. My leg would go numb 10 minutes after I was on the leg. I would cry from the pain and found a few things to help with the numbness. I went through all of my savings. I had to pay people to do everything for me. I was nothing. I had no one and I was nothing. But during this time I learned more about myself then ever before and I learned to love those who were disabled and unable to help themself. 8 months passed on the 2nd year, still unable to walk and I had a major fall outside. I had a concussion and broken ribs. I have never been in so much pain. I would literally scream for hours. No medicine or injection would help. They finally put me on morphine. I found some natural meds that helped me and I went on an apple juice detox. I got off the morphine and used ginger, horny goat and turmeric. I eventually got to where I could use just horny goat. I would have people come and read Quran on me and massage my leg but nothing helped. Then one day while on the internet I saw a story on Dr. Sebi. I was fascinated with what they said and went to his website and was shocked at his prices. I ignored the website as it was out of my budget. A few days later I read more on this man who very much fascinated me and and about the people he cured. 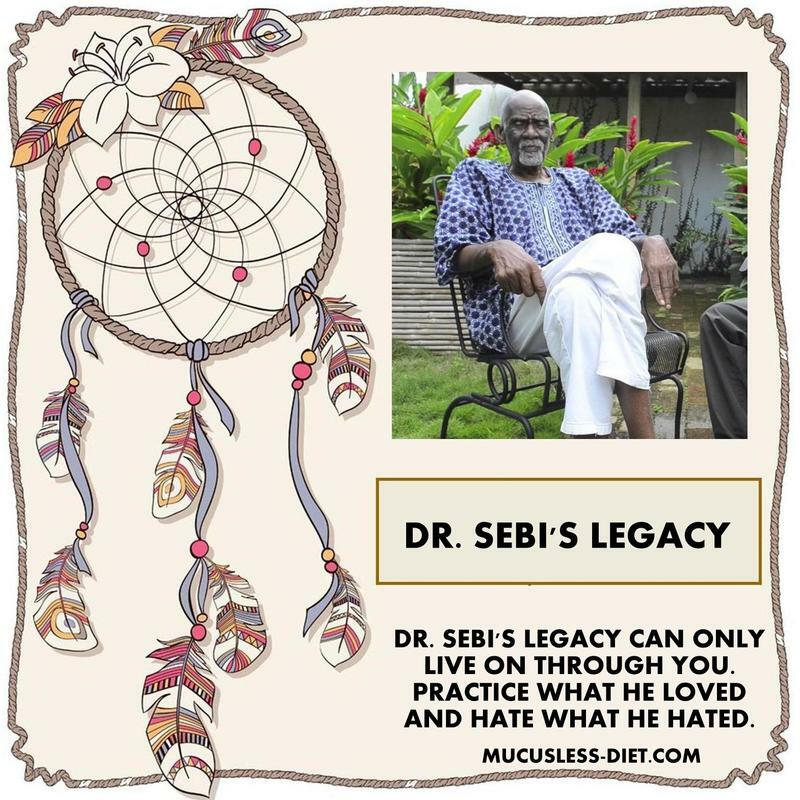 Within 2 weeks Dr. Sebi was dead. I cried and could not believe this and went and joined a few groups. There I learned more about this man who would eventually save my life. I had so many side effects from my last stroke and I told my mom every day I am not going to make it. I then went on a total fast for 12 days and had my bromide mix daily and guess what? Yes, I began to have less pain in my leg and I could walk better. IN my leg, it was like broken bones sticking thru my leg on the inside. The back tendon was so painful and bad. I loved fasting. I stopped after 12 days but would do 3 more fasts. I got to where I could walk and finally the mucus all left my body and the pain was gone. No more bone sticking through and no more cartilage damage. I still had to walk occasionally with a cane as wanted to be sure no pressure was on that leg, but I led a normal life. I could visit my neighbors, go shopping, not need a ladder when I went out etc. I was self dependent. But to this day I have some side effects of those strokes. Still have eye problems and memory problems. Even with all the Dr. Sebi herbs some things never repaired completely. What did not leave was the hurt people did to me. The laughing and the humiliation was more than anyone should bare. I lost my stores as I just could not handle them and started working with affiliate sales. Then one day a group refused to let me post articles. as you had to be approved. One of my friends got banned and I went with him. I did not like his group and I started my own group thinking maybe a few hundred would come. I am an intuitive healer and so I wanted to help others. The group has grown to almost 1900 members now and still I and you are learning about what true love is. Trying to imagine what Dr. Sebi would want us to do and trying to pray and be good enough to get God's mercy to be well. So if you see someone disabled and in need, how about you just give them a hug. I can assure you, it would help.